Something different today, and it’s not a card! I joined Aly’s Inky Fingers project club when she 1st started it up – this is project 23 and I have loved all the projects so far, but I think this is my favourite now. The calendar is made up as in Aly’s instructions so technically its not my work... but I had to share all the same! I started by covering a piece of heavy board with some lovely chandelier backing paper then punched 2 holes at the top and added black eyelets – I used my crop-o-dile to punch holes and add inserts, it’s a must have piece of kit in my opinion. 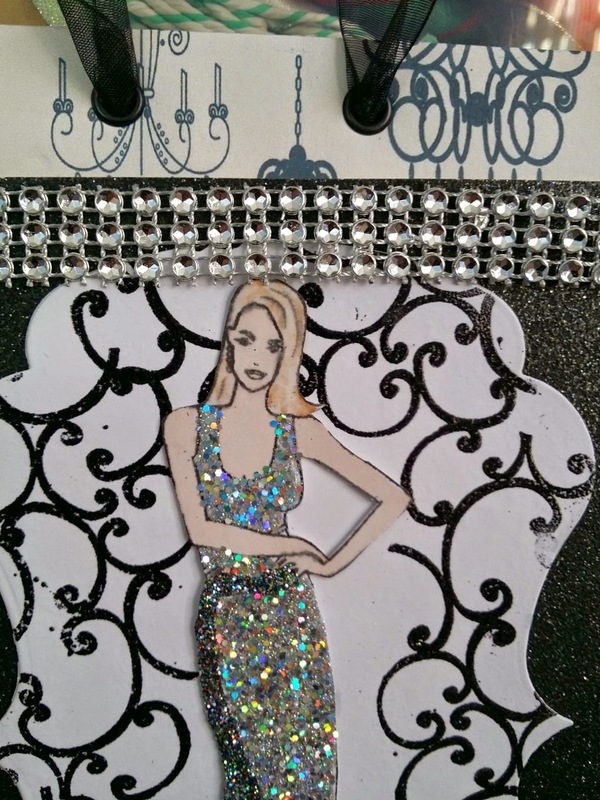 The piece of black glitter card was glued to the base card using both double sided tape and cosmic shimmer pva glue. The fancy shape in white came in the kit so I used a versamark ink pad and a scroll stamp to stamp all round the topper then covered with jet black embossing powder by Cosmic Shimmer, then heated from the back until all the powder melted and left a lovely background – I know there are a few mistakes but that’s what makes it personal to me. Next I stamped the young lady onto white card using a black memento ink pad and then cut her out. I coloured her skin with Promarker Blush and for her hair I used 2 Promarkers but sadly didn’t think to take note of the colours. 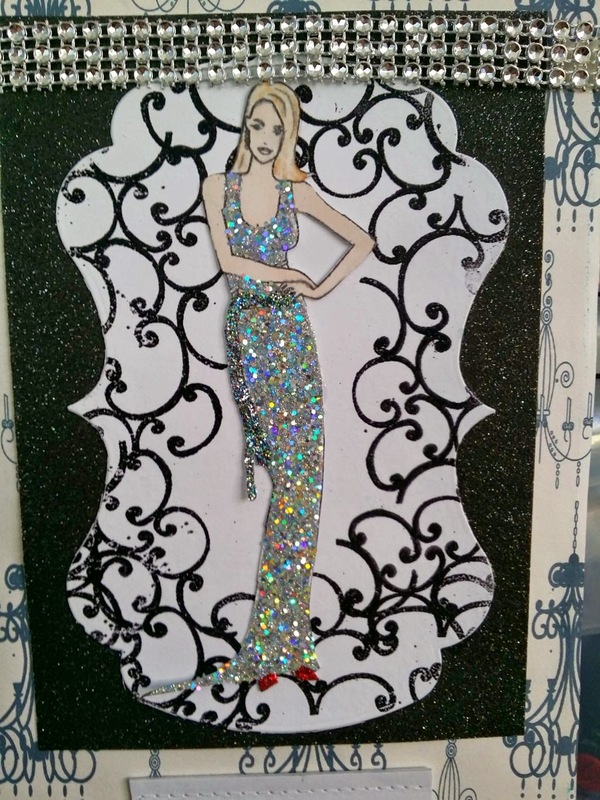 So to give my lady a dress – I used Glossy Accents to draw an outline to the dress then filled in the space, next I covered the glossy accents with Stampendous Frantage Silver Halo Mix Glitter, this is quite expensive at £5.95 for a small pot but the effect is fantastic. Once the dress had dried I tapped away the excess glitter and used the glossy accents again this time to the belt that was across her waist and the 2 dangly ends, I covered this with black mix glitter and once dry tapped off the excess. I used glossy accents and bright red glitter for the shoes. The topper was stuck to the black glitter card with glossy accents and pva then the lady was added to the topper using small glue pads. 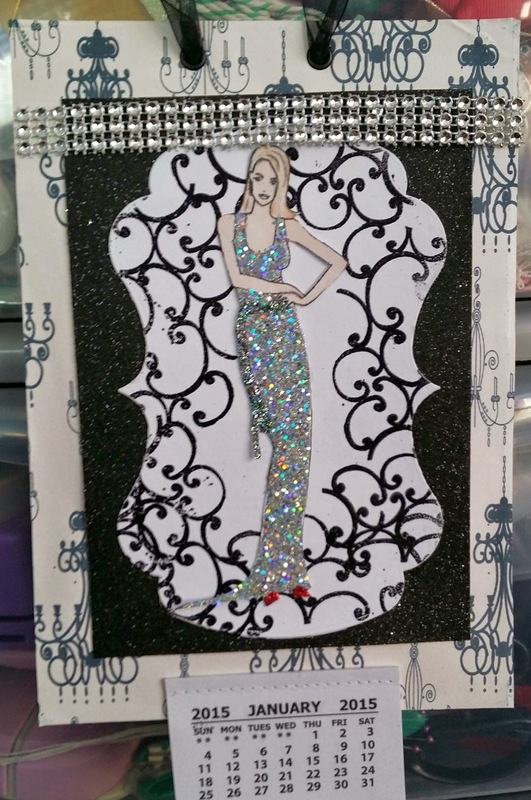 All that remained was to add the calendar tab to the bottom of the card and the length of silver trim across the top of the card, and finally threaded the black organza through the eyelets and secured it at the back with sticky tape. I have to say the calendar looks great on my craft room wall especially when they sun hits it!